My main goal is to develop better drawing and painting skills on paper and with dye-painting and surface design on fabric. At the beginning of each year, I like to define new projects which will help me progress and then remain open to new opportunities. Studying Under the Masters 3: I really enjoy this online class and registered for it during 2015, even though I was saving the content for Winter 2016. In the weekly videos I learn more about specific artists I know and meet artists I don't know. And then I stretch my painting skills by copying a painting of the Master and subsequently using those techniques in an original painting! Since I convert my copies of masterworks from oil to watercolor for each artist studied, I also experiment and learn an enormous amount in the process. This is the last time this class series will be offered by Jeanne Oliver and the artists for this series include Horace Pippin, Joan Miro, Marie Laurencin, John Singer Sargent, Gustav Klimt, and Alisa Burke. Sketchbook Skool Semester 5: I think Danny and Koosje have created a wonderful model for art education and a committed community of artists, new and old. I'm already registered for Semester 5 which is called "Expressing." And here's hoping there is a 6th Semester in 2016! Craftsy: I just signed up for "Sketching the City in Pen, Ink, and Watercolor" by Shari Blaukopf. Battery Park City Conservancy "Still Lifes and Figure Drawing" with Marla Lipkin a new 9 session class being offered this year locally in NYC from Feb. through March (9 sessions). Fashion Institute of Technology (FIT): Registration for Spring isn't until the end of January, but I intend to continue taking classes there as long as their Senior Learner program is in existence. 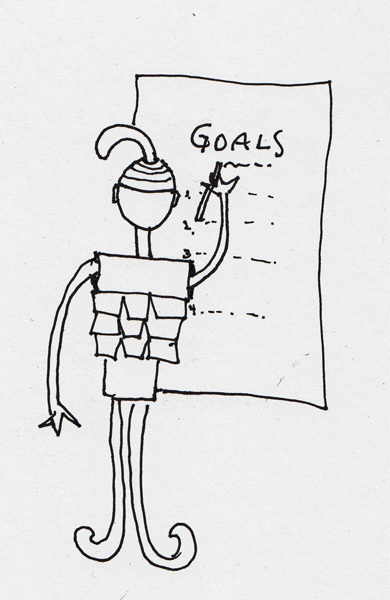 It is impossible to attend all of the art activities scheduled in New York City, so my goal is to attend a minimum of one activity/week - Meetup, Urban Sketchers, Battery Park City (May-Oct), Society of Illustrators, and to add other museum and gallery visits with my friends into those days. I will also continue to post new entries to my blog twice each week to continue my interaction with and inspiration from artists online. Continue to make my own sketchbooks - for daily drawings and for travel. Create a tutorial for my pencil-pen pocket for sketchbooks. Create another batch of paste paper for my stash. 4. Special Project: I also like to have one separate project each year. Several winters ago I sketched/elephants for a whole month using every medium I had. Another year I studied different methods for making books and made a different type of book each month for 8 months. This year I am trying to figure out how I can use some of the figure drawings I've accumulated during the last 5 years and transform them into an artist book. I already transferred images to fabric using a different method for each Quilt Journal Page (8.5 X 11") I created. Last year I made a small book of the Figures I drew in the Toulouse-Lautrec Café Society sessions at MoMA. 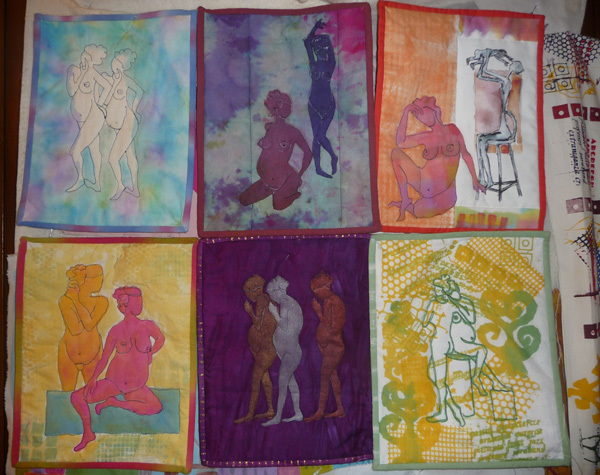 Here are the first 6 of the Quilt Journal Pages I made in 2012 using hand-dyed fabrics. I transferred drawings I made of a pregnant model at figure drawing in order to create this Mother and Child series in fabric. You put me to shame. Such an organized schedule! The quilt pieces are super. Yes, I can understand the problem of how to put them together. Maybe a box made just to fit them. Cover the box with some of your hand dyed fabrics. Hummm.